February 4, 2015 - On Tuesday a Somali-owned airline, Daallo Airlines had departed from Mogadishu with 60 plus passengers for Djibouti. Five minutes after takeoff, Flight 159 experienced an explosion in the rear of the aircraft that caused a gaping hole in the fuselage. Two passengers were injured and one passenger was killed when he was sucked outside the aircraft. The initial report indicated the hole in the fuselage was a result of a sudden air decompression at a reported altitude of 11,000 feet. However, authorities are now reporting that a bomb had been detonated onboard the Airbus A321 by the passenger who was sucked outside the aircraft, he has been identified as Abdulahi Abdisalam. Somali investigators believe Abdisalam had intended to blowup the aircraft whereby killing all onboard. Apparently Abdisalam arrived at the airport in a wheelchair in order to avoid a security check. 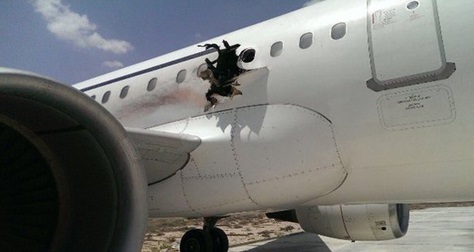 The pilot was able to land the smoked filled aircraft safely at Aden Adde International Airport, Somalia, the pilot has been identified as 64-year-old Vlatko Vodopivec. Vodopivec reported that aircraft was at 11,000 feet for 30,000 feet when the blast occurred. He further stated damage to the aircraft would have been much worse had they climbed to their cruise altitude. Security forces have reported that they have made several arrests in connection with the bombing, although no group has claimed responsibility for the blast. al-Shabab an Islamic extremist group has been responsible for a number of deadly bombings in Somalia. Residents in Balad, a town about 18 miles north of Mogadishu reported that they have found a body of a man that they believe is the same man that was sucked out of Flight 159. Authorities have been tightlipped as to the identity of this man.